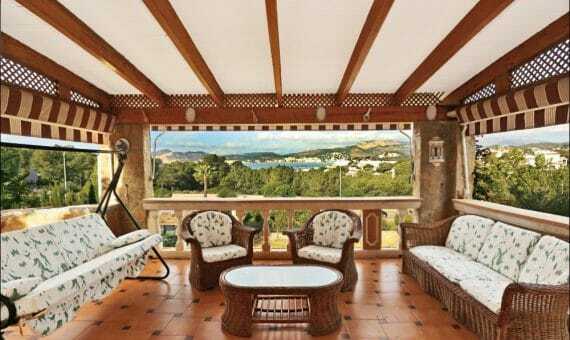 Splendid villa with lots of privacy and highest level of comfort in Nova Santa Ponsa, sought after residential area on the southwest coast of Mallorca. The house is located on spacious plot of 1.220 sqm offering amazing garden with perfectly selected Mediterranean plants and trees, heated pool, various terraces and lounge areas that invite to spend wonderful moments in relaxing atmosphere. Spacious 2-storey villa has got 775 sqm of living area and has a following distribution: on the ground floor you have a light filled living-dining room, modern kitchen with cooking island, 1 bedroom with bathroom en suite, and a guest toilet. The master bedroom with en suite bathroom and other 3 bedrooms are located on the first floor. Almost all bedrooms have an access to terraces overlooking surrounding landscapes. Additionally there is a cellar, rooftop terrace and a garage for 2 cars. The villa is located in the sought after residential area consisting exclusively by luxury properties, what guarantees desirable tranquil atmosphere. 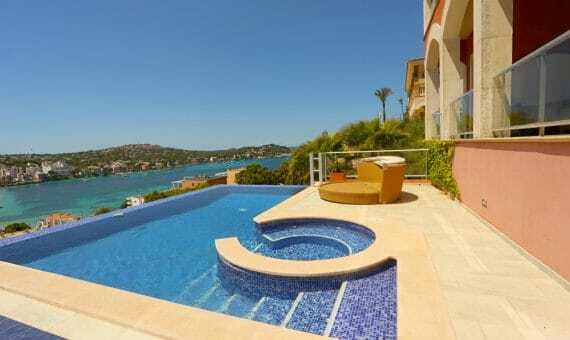 Santa Ponsa and Port Adriano, with their sandy beaches, marinas, restaurants, supermarkets, and all necessary services, as well as entertainments and sport activity centres are located nearby.